Well, I finally found a way to take pictures of myself, and so I can post pictures of the dresses that I have been making this summer. The pictures are not very good, unfortunately, because I lack anything resembling a tripod and have been hanging my camera on a safety pin jammed into my windowsill and taking “interval shots.” If I ever want to photograph anything below my knees, I will face problems, but for right now, this is sufficient. One of the joys of doing cool things in high school is that you end up with a plethora of t-shirts that you never wear. Looking for a way to utilize or dispose of some of them, I hit upon the idea of making a dress out of them! I made this before my sewing machine was functional, so I had to sew the entire thing by hand. 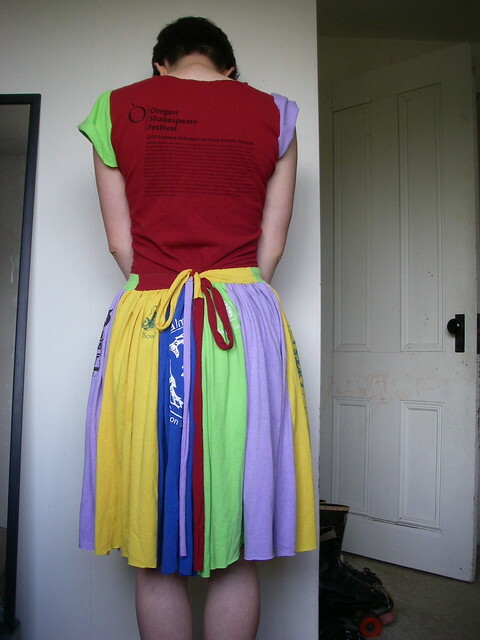 The skirt is made of three National Ocean Sciences Bowl t-shirts and one random purple t-shirt from who-knows where, and the bodice is my t-shirt from the Oregon Shakespeare Festival Summer Seminar. I made mismatched sleeves and decorative but-not-particularly-sturdy pocket, and even a sewn-in sash to help support the weight of the skirt. The purple sleeve is unfortunately folded oddly in these pictures, but I had taken so many of them by the time I realized that I decided I didn’t care. 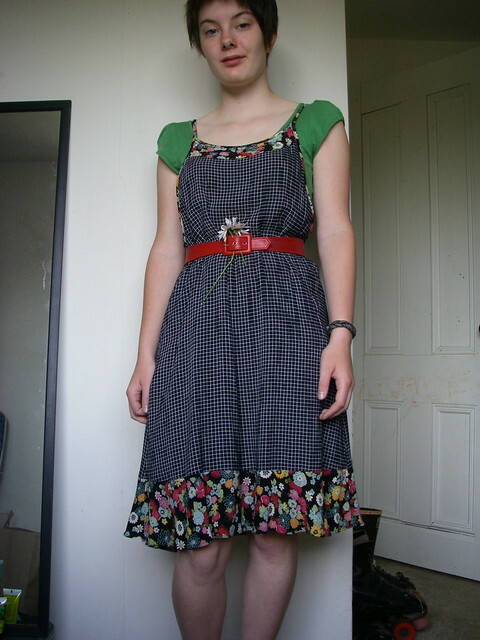 I started making this dress three years ago, sewed it all up exactly according to the instructions, basted in the zipper . . . and then tried it on and realized it didn’t fit very well. I was terribly upset and lost all interest in finishing it, but the other day I finally sewed in the zipper, shortened the hem, added snaps to the cuff, and put ties on the back, all in time to wear to a solstice party! It still doesn’t fit perfectly; there’s too much extra fabric under the arms, and the quilting cotton is really stiff. Nor will it stand up to much washing, since I didn’t zigzag the seams or anything. But, after all these years of disappointment, I am really very pleased with it. 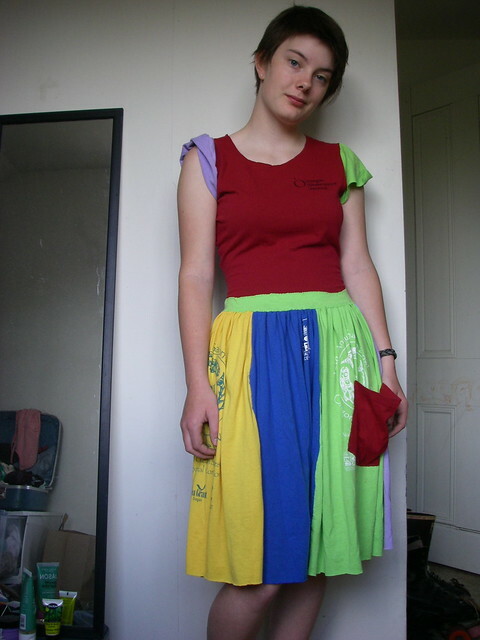 This entry was posted in outfits, refashion, sewing and tagged handsewn, ootd, outfit, tshirt on June 28, 2012 by Alice. I like clothes, theater, and boats. awesome, Alice! 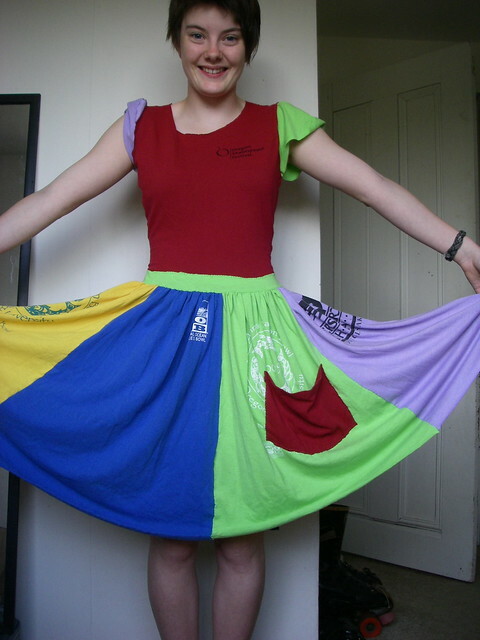 I am sending you a book today about making patterns from finished clothes. It didn’t burn after all! Oh! I looked up overcasting seams. That is what a lot of my mending consists of right now (though I didn’t know what it was called) and it is really tedious. 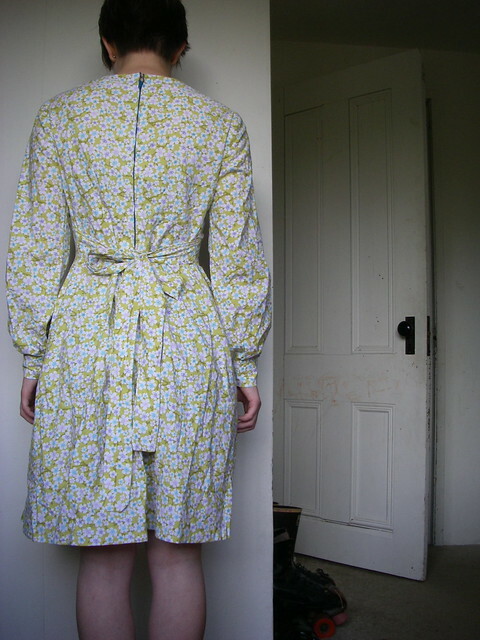 There’s a lot of seam allowance on this dress so it not imperative, but I might do that at some point.